Anyone awakened to what is going on politically in America knows the obviously staged presidential "debate" scheduled to play out Monday night (September 26) is just a formality they have to go along with to make people think they have a choice in who is elected president. Trump supporters and those who have been paying attention see it as an entertaining opportunity to see if Hillary pulls off another medical stunt. Everyone not caught up in the Hillary-mainstream media complex hypnosis is wondering, will Hillary make it through? Will Hillary collapse again? Will she have another bizarre episode of dyskinesia, head-bobbing or fazing out crazy-eyed moment? To all of these possibilities I have one question to add. How do we know that the debate has not already been carefully recorded to remove such moments? Will it really be live? Regardless of whatever the answer to this is, here is something everyone should make note of. The Hillary campaign is announcing that they will role out an entire case of characters alongside Hillary in an obvious effort to distract the masses from the direct challenges and questions Hillary would be expected to respond to in a typical true debate. The cast of bizarre characters that are suddenly being inserted into this staged debate is just another example of how the Hillary-mainstream media campaign are re-writing the rules to allow for their planned propaganda as they go. It's another example of the Hillary-mainstream media campaign tweaking the setting to their advantage in a scenario that doesn't call for other characters to begin with. A debate between two candidates is supposed to be a unique opportunity to hear DIRECTLY from those candidates, not an opportunity to pack the stage or the audience with convenient characters to be used for propaganda. This is just another reminder of how staged everything is in America today. It doesn't take a human behavior, psychology or intelligence expert to see that these characters are there to distract from Hillary herself and to provide a necessary alibi in case the attention needs to be taken away from Hillary. Taking a look at the hired staged characters the Hillary-mainstream media complex are planning to role out it is easy to see all the hidden obvious agendas at play. When Hillary Clinton takes to the stage Monday night, she'll be addressing an audience that includes several guests intended to underscore her campaign narrative that she is a fighter for women and children. Lauren Manning, who was injured in the 9/11 attacks and spoke at this year's Democratic National Convention will be among Clinton's guests, a Clinton official said. Clinton worked with Manning to get benefits for survivors and first responders after the terrorist attacks. Maxine Outerbridge, a single mom who survived domestic violence, provides a face for Clinton's work on behalf of the Children's Health Insurance Program. Anastasia Somoza, the woman with cerebral palsy who said at the DNC that she pitied Trump, will also be in attendance along with Aleatha Williams, who become pen pals with Clinton when she was 8 and Clinton was first lady, the campaign official said. 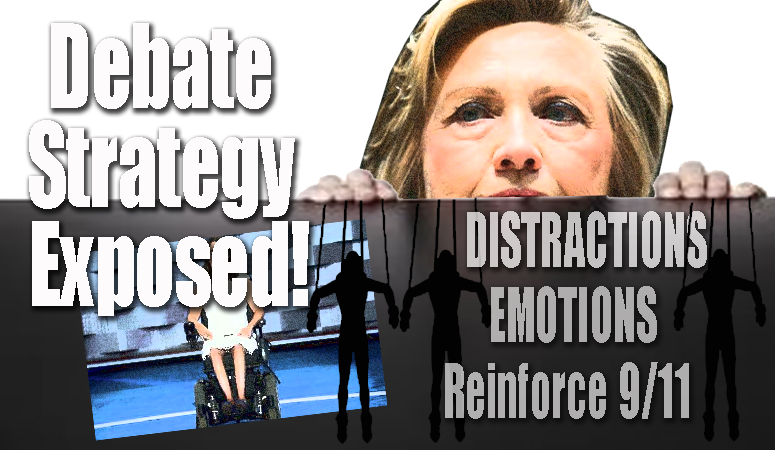 So let's review that Hillary Clinton psyop debate strategy packed with hidden agendas and in-your-face over-the-top propaganda. First, notice that all the stage props will be tailored to the votes Hillary is vying for which is Women. The obvious absence of men in her guest list is a big call to the Neo-Feminist of America for the purposes of further polarizing America. I believe this is a psychological tactic similar to the Edward Bernays "torches of freedom" psyop in the 1920's to get women to "take a stand" and smoke away to prove that they are humans, they are brave. Ultimately, this appeal to only women is just another form of dividing America no different than the race card, the LGBT card, the religion card, nationality card and other subdivisions the ruling elite love to exploit to divide Americans so that they are not focused on the real enemy of humanity which is the ruling elite themselves who fund these movements. Secondly, notice she's still selling the "care for children" psyop to everyone. Here are a few things hidden behind this agenda. 1- Hillary has a history of advocating that your children belong to the state. Today she is continuing the notion that the government is responsible somehow for your children. In fact, the Washington Times recently discussed a 1977 report titled 'All Our Children' which Hillary was hired as a researcher for. This report clearly indicates that Hillary thinks your children somehow belong to the state. The Carnegie panel started out with the assumption that the "triumph of the 'universal entitlement state' was inevitable, and the best thing Americans could do for their children was to hasten its arrival," Ms. Milton noted. Just like U.S. education has been handed over to the state, so too, should other responsibilities, lessening the cultural impact of divorce, and demise of the nuclear family within our society. Ms. Milton notes the report advocated for universal health care, expanded family leave, fully deductible child care, childhood disability insurance, generous income supports for poor families (all of which Mrs. Clinton has touched on the campaign trail), and full employment through government-created jobs if necessary. There was hardly a footnote as to how to pay for these programs or their perceived consequences. The report offered "a blueprint for undermining the authority of parents whose values the authors considered outmoded," Ms. Milton wrote. In the chapter that Mrs. Clinton worked on, titled "Protection of Children's Rights," it reads "it has become necessary for society to make some piecemeal accommodations to prevent parents from denying children certain privileges that society wants them to have." The chapter goes on to explain that some of these "privileges" should be allowing children to consult doctors for pregnancy and drug-related issues without parental consent, and prevent schools from expelling or suspending disruptive students. It's most outrageous claim, however, is the adoption of a "public advocate," who are people that can speak to children's issues, upending the parents' wishes. This goes to the heart of the Common Core government brainwashing program that is in full effect now for years and the appeal to the women of America that you are supposed to give and entrust your children to the government. This theme will play out nicely in the staged debate. 2- Similarly as can be seen above Hillary is calling for parents to surrender their children to the government's brand of health care. This "health care" of course involves making sure all the children accept their government approved vaccines, abortions and more. The third thing to notice aside from the whole women and children appeal is that the emotional card which is being used to (as usual) sell the government's 9/11 official story to the sheep. Aside from the Cerebral Palsy patient designed strictly for emotions and to make Hillary look caring, a woman named Lauren Manning is being inserted into the stage to sell the 9/11 official story and remind Americans of what 9/11 felt like. Of course this prop will also be used to remind people of the "war on terrorism" conveniently while the US supports their ISIS terrorists in Syria with air attacks. This reference to 9/11 will conveniently (they hope) serve to make people forget that all terrorism today is funded and supported by the US and their NATO allies themselves. All of this stuff is absolute monkey business and anyone taking this presidential candidate debate serious is ignoring the political reality of today in America. I'm talking about legalized propaganda, outright corruption, staged events occurring nationwide just to distract the masses from the US government's 100% support of their ISIS terrorist fighters in Syria and high level trickery pushed by the corporate mainstream media. Sadly this is the world we now live in. We live in a world of lies where virtually every story put out by mainstream media is staged nonsense altered and manipulated in real-time for political reasons and for the purposes of mass deception. This is a reminder that mainstream media "news" today is a form of mass sorcery that we should make an extra effort to protect our minds from. Incidentally, this is precisely one of the important messages in my book 'The Art of Overcoming the New World Order' which I encourage readers to read before falling for any more mass media headlines and staged breaking news.